The Angel has a new friend. Today, Question (indie studio with veterans of the Bioshock series, Dishonored, Eldritch and more) are pushing the first major update to The Blackout Club servers for 2019. The Stalker PvP update lets players invade co-op games on the opposing team, presenting as another teenager playing on the side of Redacre's very own boogeyman. At first, players will be unaware of the intrusion as Stalkers come unannounced and uninvited, but for those with a keen eye they'll notice a fellow player watching their every move, collecting info on their sinful activities, and reporting this all back to The Angel. 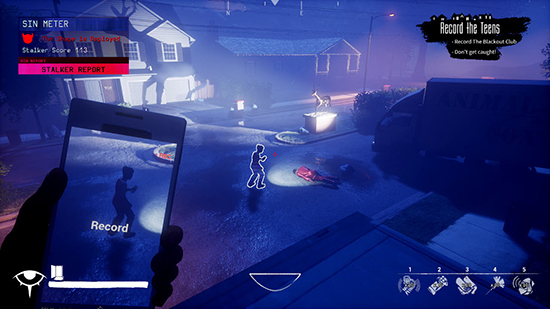 The Stalker uses their phone to sneakily take photos of the cooperative players, bringing all sorts of trouble down on their targets. It is a desperate, adrenaline-charged process for both sides as the Stalker is always alone, against up to 4 cooperating players yet capable of wreaking havoc on any potentially successful mission. Your friend has gone missing. Something is amiss in Redacre and the adults aren't listening. It's up to you and your high school friends to figure it out. The Blackout Club is a 1-4 player horror co-op game all about working together and trying to unveil the dark secrets beneath the surface of Redacre. The boogeyman known as Angel looks over Redacre. All-seeing as the adults report the sins of the youth trying to unveil the cultish activities happening in the town. Those committing the most faults are hunted by this entity, which is only visible when you close your eyes. Captured players have shared stories of hearing voices and waking up in their beds with signs of blackout activity, or "lost time." Others report demonic messages written across their mind's eye. Are these lucid memories or just the excitement of playing getting to people's heads? The primary focus of this update has been the introduction of the new STALKER MODE. Playing as a stalker pits you as a kid working against the club. You invade their missions and record them for the enemy. Every time you record them or their crimes their sins are logged, notifying the nearby AI and eventually calling out The Shape. Once the shape is out, every recording shows the shape where the kids are. You are victorious if every member of the club is put to sleep by the shape. THIS IS VERY HARD TO DO! The stalker is very weak relative to the club, so victory will be rare. Your score is stored however and you can be rewarded just for that. More on that later. To invade a game requires a STALKER DOSSIER. These are seeded into the world on conditions you will have to discover yourself and will be rare initially. When you invade a game you can move between red doors and enter unannounced. The kids will NOT know you are there until you start recording them or their sins. Each time you do this they receive an in game message. If they catch you, YOU LOSE, if they complete their mission, you ALSO LOSE. So be sneaky, be careful, choose your moments! You can return to the red doors after a cooldown, use them smartly to lose pursuit and confuse your enemies. As loyal club kids you may be invaded by a stalker after reaching LEVEL 5! When they enter your mission you will NOT KNOW until they start recording you. Work as a team to bring them down for bonus XP. The kid that catches the stalker also gets added to the leaderboard and gets a little extra XP. After you have been invaded once, you will not be invaded again until you invade someone else. Once you have invaded another player, games you host can be invaded going forward - INVASION IS OPTING INTO STALKER MODE. Stalkers can only invade missions that have more than one player to make sure the club kids have the advantage. So team up if you want to see Stalkers! With this update come new leaderboards: Most Stalkers Caught, Most Wins As Stalker, and Highest Stalker Score. Every week these leaderboards will reset, and the players at the top of each will receive a unique customization that can only be earned through this system! You can view the Stalker Wins and Score in the new Stalker Van (available after level 5), and the Stalkers Caught leaderboard is visible in the normal hideout. We have tested this mode internally as much as we could, but we realize that the reality with live players could be very different. We expect to continue to iterate on this mode and make changes based on community feedback. Invasions may be too rare or too common, Stalkers might not have enough missions available to invade, there is much we expect to learn and we look forward to hearing what you think. Stalking is not available ALL THE TIME by design, we consider this an addition, not the core mode of play. As usual this update comes with many fixes and improvements including basic eye animations for the kids (your eyes even close when you shut them in game), a new Sleeper pajama mesh (hi mom! ), and fixes to missions and level geo. There have also been significant optomisations to reduce load on the CPU, which should really help frame rates on host players. The Blackout Club is available now in Early Access on Steam with plans to launch into 1.0 later this year on PC and Consoles.